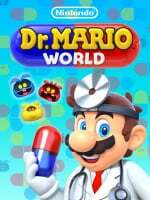 At the beginning of February, Nintendo announced Dr. Mario World for iOS and Android devices was targeting an "early summer" global release this year. The free-to-download title is being co-developed by LINE Corporation and NHN Entertainment and will include optional in-app purchases. LINE is dedicated to creating a world that seamlessly connects people, information, content, and services anywhere, anytime, and at the most comfortable distance. Would you like to see more socially-connected Nintendo games with the assistance of technologies such as LINE? Tell us below. Line is generally fun and a good communication and social network platform. @SakuraHaruka If only it would. Miiverse was the only social platform I actually liked. When a Nintendo app has better social options than their software on their own hardware..
@Dpullam Thanks. I was trying to harken back a bit to the good old days of Nintendo Life - the NL golden age, if you will. A time when literally every single sub-headline used a pun of that caliber. One would think it was all just a dream. @andywitmyer Haha I remember those days. Good ol' Thomas Whitehead. Ah yes, old Thomo. Those were the days. I had honestly never heard of line before they did Skullgirls mobile and those Disney match 3 games. If they did a good job with Skullgirls, I would imagine that Dr. Mario would be a breeze. It will work in Japan but it's really not common in other places, even nearby countries have their own versions like Kakao. ...LINE stickers are very cool though! @SakuraHaruka it is very likely. Maybe a Miitomo hybrid? Which would be nice. Line is basically universally used here in Japan. In the nearly 4 years I have lived here, I have yet to meet someone living here who does not use it. I'd love to see Tomodachi Life meets Miiverse to be honest. I can just imagine an app like that, on mobile and switch. @Heavyarms55 In four years you've never met someone using Line? Or did you miss out the word not? I believe almost everyone in UK is not at all familiar with Line. Maybe Nintendo Life could explain and show Line's work a bit before throwing this at us? @Lionyone I meant to say I have yet to meet someone who does NOT use it. That's what happens when I type real fast and don't read my comments before posting. @Heavyarms55 Thanks. Line sounds a very cool service. @Lionyone For the most part, it is just a better version of basic text messaging and internet phones. I like it because you can use it to make international calls without any extra fees because it uses your data instead. Some people use it full tilt, they get a phone plain with almost no actual minutes, or like, only 10 minutes a month, and use Line 100%. @GrailUK It's torture playing WiiU games with Miiverse ripped out of them. I still don't understand Nintendo's decision to dispose of such a lovely social media platform. Why not bring it Switch? It's just one of the many examples of how I feel that Nintendo's heart died with Iwata and corporate coldness filled the gap. I wouldn’t be surprised if it came to being some kind of mobile chat platform for Switch. Its pretty smart, let a company who is experienced with online chatting handle it leaving Nintendo with little responsibikity or liability when it comes to online interactions in chat form. If this is LINE we're speaking of, I definitely would not mind having webtoons on my Switch. LINE is so ubiquitous in Japan that it's a wonder this didn't happen sooner. As I've said before, all their mobile games should be put on switch. It only makes sense to expand their mobile games to their own devices. LINE isn't as well known in the UK than over in Japan.